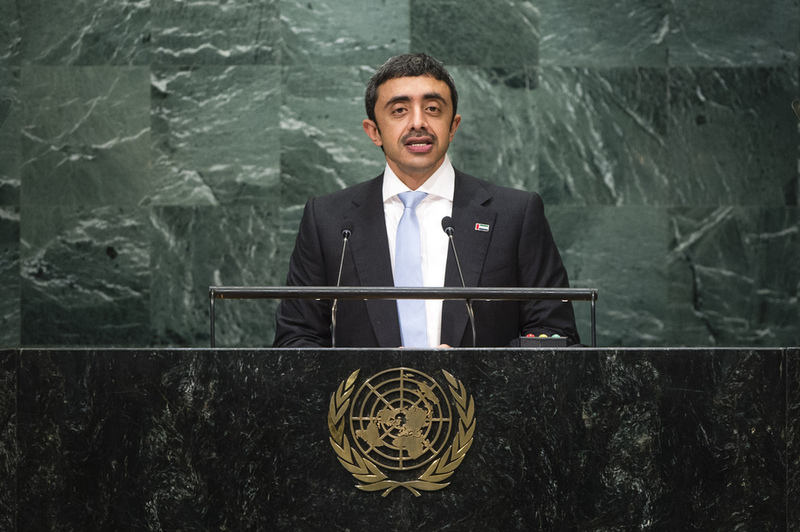 SHEIKH ABDULLAH BIN ZAYED AL NAHYAN, Minister for Foreign Affairs and International Cooperation of theUnited Arab Emirates, said that several countries in the region were facing multiple crises and conflicts ignited after 2011. A number of Arab countries had descended into internal fighting and the plight of the Palestinian people continued under Israeli occupation without a just solution on the horizon. Countering terrorist groups was a right and duty of all; however, resorting to “blindly placed laws”, such as the United States Congress’ Justice against Sponsors of Terrorism Act, ignoring the effective roles played by a number of nations, would lead to further arbitrary policies and destabilize relationships between allies. He went on to observe that Iran, with expansionist regional policies and interference in its neighbours’ internal affairs, had played the greatest role in causing regional tension and instability. Despite the nuclear agreement reached between Iran and the P5+1, he said, that country had continued its efforts to undermine regional security through aggressive rhetoric and by developing its ballistic missile programme. With regards to Libya, he said that his country welcomed the Skhirat Agreement and the formation of the Government of National Accord. On Syria, the United Arab Emirates saw no possibility of resolving the crisis through military force. “Bandaging the wounds” by repeating charitable humanitarian efforts or holding international conferences were no substitutes for resolving such crises. His country had built mechanisms to protect youth by establishing the Hedayah Centre to combat extremism and the Sawab Centre with the United States. It had also established the Muslim Council of Elders and the Forum for the Promotion of Peace in Muslim Communities to demonstrate the true face of Islam. However, regional crises should not distract from his country’s core issue — its sovereignty over three islands, Greater Tunb, Lesser Tunb and Abu Musa, occupied by Iran against the provisions of international law and the Charter. The United Arab Emirates had called on Iran to return the islands, particularly through international justice or arbitration, and would continue to do so. He affirmed that his country would never give up its right over those islands.